Jane Hall is Distinguished Professor of Health Economics in the UTS Business School and the Director of Strategy for the Centre. She was the founding Director of CHERE and held that position until 2012. She is a President Elect of the Academy of Social Sciences in Australia; and also a Fellow of the Australian Academy of Health and Medical Sciences. She received the National Health and Medical Research Council Outstanding Contribution Award in 2017; and was named as one of Australian Financial Review/Westpac100 Women of Influence in 2016. In 2012 she was recognized with a UTS Vice-Chancellor's Award for Research Excellence in Research Leadership. 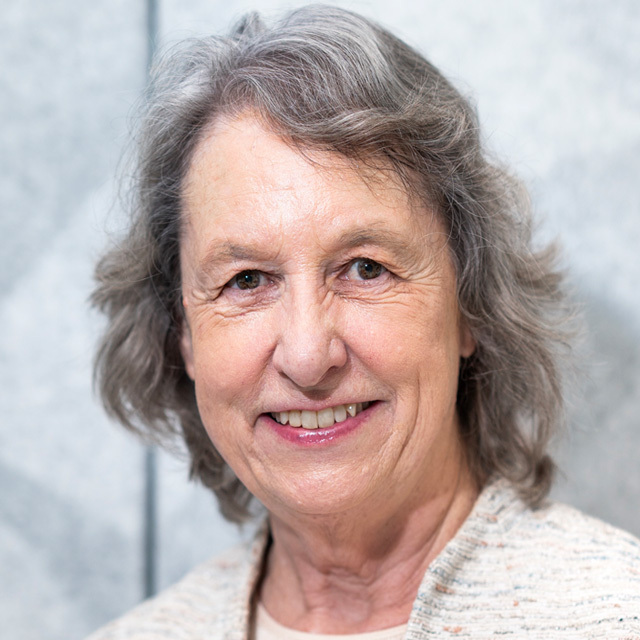 In 2011 she was awarded the inaugural Professional Award made by the Health Services Research Association of Australia and New Zealand, for her outstanding contributions to research, developing the field and mentoring others. She has worked across many areas of health economics, including health technology assessment, measurement of quality of life, end of life care, health workforce, the economics of primary care and funding and financing issues. She is involved in health policy issues internationally through her involvement with the Commonwealth Fund International Program in Health Policy and Practice. Jane has been an active member of numerous committees and working parties. She is a member of the Independent Hospital Pricing Authority. Economic evaluation of public health programs; evaluation of informal (unpaid) care; the implications of genetic screening; and health workforce issues. Humans have an almost unbounded ability to adapt their behaviour to perform different tasks. In the laboratory, this flexibility is sometimes viewed as a nuisance factor that prevents access to the underlying cognitive mechanisms of interest. For example, in order to study automatic lexical processing, psycholinguists have used masked priming or evoked potentials to measure 'automatic' lexical processing. However, the pattern of masked priming can be radically altered by changing the task. In lexical decision, priming is observed for words but not for nonwords, yet in a same-different matching task, priming is observed for same responses but not for different responses, regardless of whether the target is a word or a nonword (Norris & Kinoshita, 2008). Here we show that evoked potentials are equally sensitive to the nature of required decision, with the neural activity normally associated with lexical processing being seen for both words and nonwords on same trials, and for neither on different trials. incentives in 2008, and there was a small fall in this proportion by 2011.
likely to use grants and incentive payments. Selected Characteristics of the Health Care System and Health Outcomes in Australia. and case histories; to compare this country with others, see the interactive graphic).1 Universal, tax-financed comprehensive health insurance, Australian Medicare, has been largely stable for three decades. Yet this performance has been achieved through, or despite, the interplay of public and private financing, public and private service provision, and a division of responsibilities between the federal and state governments. The main political parties clash over the role of government and whether national health insurance in its current form should continue. Hall, J.P. 2013, 'The tale of out of pocket spending on health care', Medical Journal of Australia, vol. in press. Background and objective: Long-term adherence to inhaled corticosteroids is poor despite the crucial role of preventer medications in achieving good asthma outcomes. This study was undertaken to explore patient preferences in relation to their current inhaled corticosteroid medication, a hypothetical preventer or no medication. Methods: A discrete choice experiment was conducted in 57 adults with mildmoderate asthma and airway hyper-responsiveness, who were using inhaled corticosteroid =500 µg/day (beclomethasone equivalent). In the discrete choice experiment, subjects evaluated 16 hypothetical scenarios made up of 10 attributes that described the process and outcomes of taking asthma medication, with two to four levels for each attribute. For each scenario, subjects chose between the hypothetical medication, the medication they were currently taking and no asthma medication. A random parameter multinomial logit model was estimated to quantify subject preferences for the aspects of taking asthma medication and the influence of attributes on medication decisions. Results: Subjects consistently made choices in favour of being able to do strenuous and sporting activities with or without reliever, experiencing no side-effects and never having to monitor their peak flow. Frequency of collecting prescriptions, frequency of taking the medication, its route of administration and the strength of the doctor recommendation about the medication were not significant determinants of choice. Conclusions: The results of this study suggest that patients prefer a preventer that confers capacity to maximize physical activity, has no side-effects and does not require daily peak flow monitoring. Effective control of asthma requires regular preventive medication. Poor medication adherence suggests that patient preferences for medications may differ from the concerns of the prescribing clinicians. This study investigated patient preferences for preventive medications across symptom control, daily activities, medication side-effects, convenience and costs, using a discrete choice experiment embedded in a randomized clinical trial involving patients with mildmoderate persistent asthma. The present data were collected after patients had received 6 weeks treatment with one of two drugs. Three choice options were presented, to continue with the current drug, to change to an alternative, hypothetical drug, or to take no preventive medication. Analysis used random parameter multinomial logit. Most respondents chose to continue with their current drug in most choice situations but this tendency differed depending on which medication they had been allocated. Respondents valued their ability to participate in usual daily activities and sport, preferred minimal symptoms, and were less likely to choose drugs with side-effects. Cost was also significant, but other convenience attributes were not. Demographic characteristics did not improve the model fit. This study illustrates how discrete choice experiments may be embedded in a clinical trial to provide insights into patient preferences. Kovoor, P., Love, A., Hall, J., Kruit, R., Sadick, N., Ho, D., Adelstein, B.A. & Ross, D.L. 2005, 'Randomized double-blind trial of sotalol versus lignocaine in out-of-hospital refractory cardiac arrest due to ventricular tachyarrhythmia. ', Internal medicine journal, vol. 35, no. 9, pp. 518-525. AIM: We aimed to compare the efficacy of sotalol versus lignocaine for the treatment of patients with out-of-hospital ventricular fibrillation refractory to > or = 4 defibrillatory shocks. BACKGROUND: The outcome of patients in ventricular fibrillation refractory to > or = 4 defibrillatory shocks is poor. In a previous randomized trial, sotalol was superior to lignocaine for acute termination of ventricular tachycardia not causing loss of consciousness. METHODS: Patients of the Ambulance Service of New South Wales treated by paramedics with continued ventricular fibrillation despite standard resuscitation and > or = 4 defibrillatory monophasic shocks were eligible. Drug doses were sotalol 100 mg or lignocaine 100 mg, given as i.v. boluses. A further 2 min of cardiopulmonary resuscitation was given and then defibrillation was repeated twice. If this failed, half the initial dose of the trial drug was repeated and a further > or = 2 shocks were given. RESULTS: Sixty patients were randomized to sotalol and 69 randomized to lignocaine. There was no significant difference between the two groups in the clinical characteristics of the patients or in the number of shocks received. Outcomes in the sotalol and lignocaine groups were survival to hospital admission in 7 (12%) and 16 (23%), respectively (P = 0.09), and survival to hospital discharge in 2 (3%) and 5 (7%), respectively (P = 0.33). CONCLUSIONS: Sotalol is not superior to lignocaine for treatment of ventricular fibrillation refractory to multiple shocks. The overall outcome of this group of patients is poor regardless of the pharmacological intervention (lignocaine or sotalol). Hall, J.P. 2000, 'Health For All The Impossible Dream? ', Lancet, vol. 356, no. 0, pp. 0-0. King, MT, Hall, JP, Caleo, S, Gurney, H & Harnett, P 2000, 'Home Or Hospital? An Evaluation Of The Costs, Preferences, And Outcomes Of Domiciliary Chemotherapy', International Journal Of Health Services, vol. 30, no. 3, pp. 557-579. Viney, RC, Fulham, MJ, McCaughan, BC, Boyer, M & Hall, JP 2000, 'Evaluation Of The Role Of Positron Emission Tomography In Oncology', Medical Journal Of Australia, vol. 172, no. 9, pp. 459-0. Hall, JP, Viney, RC & Lourenco, R 1997, 'Whither Private Health Insurance? ', Australian And New Zealand Journal Of Public Health, vol. 21, no. 3, pp. 347-348. In a recent issue of this journal, Tabarrok provided an economic analysis of genetic testing (Tabarrok, 1994). As genetic research progresses, the identification of individuals at risk of particular diseases, early treatment for those affected and the avoidance of inherited genetic disorders will become more frequent. As Tabarrok states (p. 76) "this ... is accompanied by benefits and costs". His analysis then proceeds to identify the costs and benefits of genetic testing, describe the moral dilemmas and inefficiencies created by testing and propose a solution to the testing problem.The essence of his analysis is this. First, the benefits of genetic testing are improved health, which will be achieved through effective and often earlier therapy, the avoidance of additionaI risks by susceptible individuals and, through pre-pregnancy and antenatal testing, what is in effect selective breeding. Second, the cost of testing will be relatively low. Third, the individual faced with the option of testing has a small probability of a high loss as those with "'bad genes"
Hall, J 1996, 'The challenge of health outcomes. ', Journal of quality in clinical practice, vol. 16, no. 1, pp. 5-15. The health outcomes initiative can be seen as another passing phase in health-care management or taken as a serious challenge to the planning, management and evaluation of health services. This paper explores those challenges. Implementation of the health outcomes initiative will require the application of valid, reliable and appropriately sensitive measures, the use of a broad approach to research, development and monitoring in such a way that it is an intrinsic part of service delivery, the adoption of policy and practice that is firmly based on evidence of outcomes, and the development of an approach to research that emphasises generalizability. To examine the validity of the additive quality-adjusted life year model used to evaluate a multiphase health state, data from a pilot study of mammography were used to determine whether the values assigned to a multiphase postmastectorny health state could be estimated from a combination of the independently rated constituent health state values. The results suggest that they cannot. Hall, J & McGuire, A 1991, 'Health economics in Australia. ', Australian journal of public health, vol. 15, no. 2, pp. 78-80.
latest panacea from the National Health Service in England. Wong, C & Hall, J 2015, 'Does the quality of general practitioners affect the use of emergency departments? Evidence from a survey of Australian adults', Primary Health Care Research Conference, Adelaide. Hall, JP 2015, 'GP visits on diabetes outcomes: methods and initial findings from WA and NSW person-linked data', 9th Health Services and Policy Research Conference (HSRAANZ), Health Services and Policy Research Conference (HSRAANZ), Melbourne. Kenny, P., King, M.T., Shiell, A., Seymour, J., Boyages, J. & Hall, J.P. CHERE 2000, Quality of life three months and one year anter treatment for early stage breast cnacer, CHERE Discussion Paper No 42, Sydney. Hall, JP, Viney, RC & Wiseman, V CHERE 1997, "Unorthodox, troublesome, dangerous and disobedient": a feminist perspective on health economics, CHERE Discussion Paper No 33, Sydney. Cooper, L & Hall, JP CHERE 1997, Cost of organ and tissue donation in NSW - Report the NSW Department of Health, CHERE Project Report No 3, Sydney. Hall, JP & Mooney, G CHERE 1991, Estimating benefits for economic evaluation, CHERE Discussion Paper No 2, Sydney. Donaldson, C & Hall, JP CHERE 1991, Economic evaluation of health care Guidelines for costing, CHERE Discussion Paper No 1, Sydney.